Commendable performances from two strong actresses, but the film itself lacked depth and drama. Did you know Scarlett Johansson was originally meant to be the star of this new film? Yes, that’s right. The film was planned for Johansson, and was supposed to be released in 2007. When she dropped out, the management were in crisis, until 2012 when it was announced Saoirse Ronan would take on the role. Boy are we glad she did. Directed by theatre star Josie Rourke, Ronan stars alongside Margot Robbie and David Tennant in this dramatic retelling of the 1569 conflict between England and Scotland, culminating in the execution of Mary Queen of Scots. The film opens with Mary, played by Ronan, arriving in Scotland and assuming her duties as Catholic Queen of Scotland. When this news reaches Queen Elizabeth I (Robbie), the Protestant Queen of England, she feels her sovereignty is threatened. The film then follows the ensuing battle between the two fiery monarchs as they meddle in each other’s lives and attempt to manipulate the other’s decisions. The rivalry continues for several years, during which Mary births an heir, Elizabeth contracts small pox, and a civil war develops. 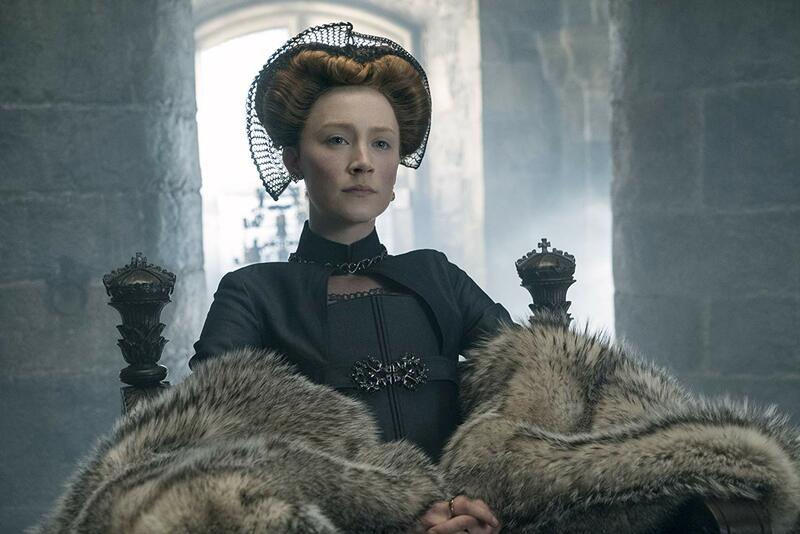 The tension finally amounts to a meeting between the two – a historically inaccurate fact – before the execution of Mary Queen of Scots is ordered. Both Robbie and Ronan give stellar performances. Ronan brings a stoic, powerful persona to the role of the fiery Scottish Queen, whilst Robbie’s delivery of vulnerability, fear but also strength is both convicing and heartbreaking. The duo also deserve praise for their chemistry, despite only briefly appearing together in the film. The pair are well-matched, making the film even stronger. The costume design is equally impeccable as well as the talent of the make up artists. I will always wonder how they managed to make Robbie look so ugly as a post-smallpox Queen Elizabeth I! It is no wonder that most of the awards the film is nominated for revolve around styling and design. Despite this, the film can be criticised for its historical inaccuracy. Most notably is the meeting between the two Queen’s in the movie, that simply never occurred in real life. Whilst Elizabeth did fall ill with smallpox, this was not the reason behind the cancellation of the initially planned between the two royals. However, the movie does portray many true facts. Mary did ride a horse like a man did, she was tolerant of a plethora of faiths, Darnley did enjoy sexual favours with men, and Mary did wear a red dress to her execution. Whilst the historical accuracy may still be an active debate, many questions are raised, nonetheless, about the making of the film itself. What was the initial attraction to creating this film? It can hardly be described as action-packed nor a lively retelling of a key moment in history. Mary Queen of Scots is not jam packed with facts, nor is it a particularly curious story to be told. The truth is, whilst the performances are commendable and the film a picture of beauty, the story is lackluster. If the filmmakers felt the need to alter key facts in the movie to make it more dramatic or interesting, than why make it in the first place? Mary Queen of Scots is a film full of talent: skilled actresses and actors, proficient stylists and effective directors. But the film lacks historical veracity and the story lacks activity – it lacks a climax. In a year of stunning historical movies being released, including The Favourite, this film unfortunately just fell flat. Mary Queen of Scots, directed by Josie Rourke, is distributed in the UK by Universal Pictures International, certificate 15.